My favorite gifts to give are pampering ones. Most people don’t take the time to truly pamper themselves and these kind of gifts give people a reason to take some time out for themselves. 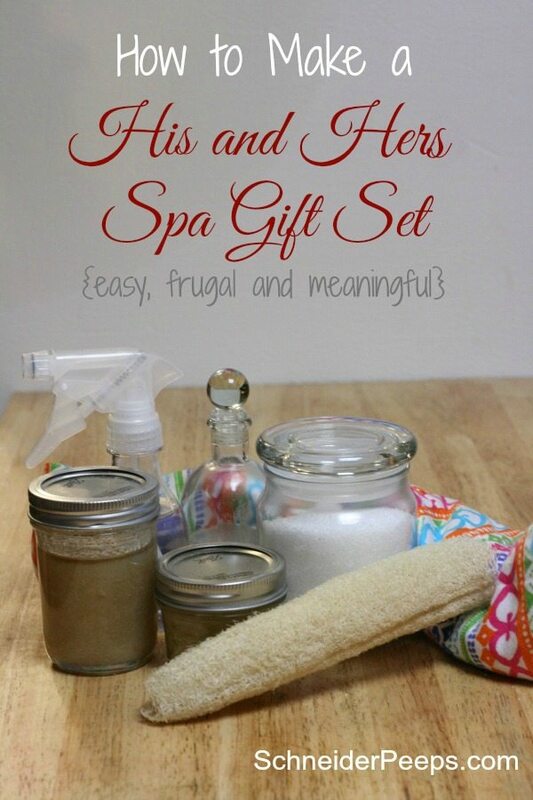 If you are struggling to find that perfect gift, consider spending an afternoon making some his and hers spa gift baskets. You can mix and match the items in these sets to customize them for your recipient. You also do not have to use only one scent, use what goes together and what you think the recipient might like. A note about essential oils: They are all the rage right now and even though I’ve been using them for over 20 years I don’t think they are the “be all and end all” of health. I do think that they definitely have a place in helping to maintain our overall health. They are very strong, not just in scent but in function, so when in doubt use less. Also, many essential oils are not safe to ingest. Now, if you use some peppermint essential oil in your lip balm and lick your lips, you’re going to be just fine – just don’t eat it. To learn more about self care using essential oils and herbs, I highly recommend this course from The Herbal Academy. 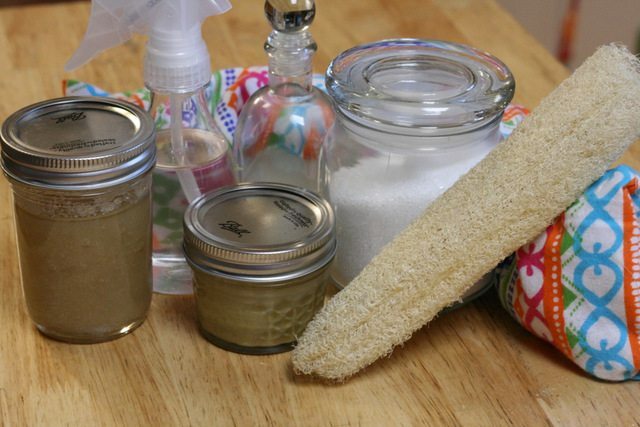 Scented bath salts are super easy to make and are a great addition to a spa gift basket. All you need is Epsom salts and essential oils of your choice. Depending on the oil, just a drop or two of essential oil is enough for a cup of Epsom salts. A sugar scrub is great for exfoliating. This is one that I don’t really use exact measurements (are you surprised?). 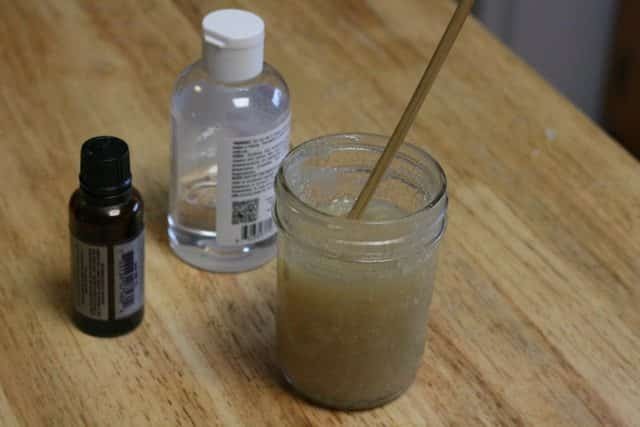 I just put some sugar in a jar, add enough glycerine to make it like a paste and then add few drops of essential oil. You can find more scrub recipes here. Hard lotion is a really great product for dry skin. It’s a combination of beeswax, coconut oil, shea butter and essential oil. I use the recipe in My Buttered Life by Renee Harris. I use the wax from our bees which is kind of cool and sometimes I leave the essential oils out to let the beeswax scent be the scent. I like to add some linen spray to the spa packages. At the end of a long day, there is nothing more soothing than crawling into a bed that has been spritzed with a lovely scent. This is another recipe that I just kind of make without feeling like I need to be precise in measurements. 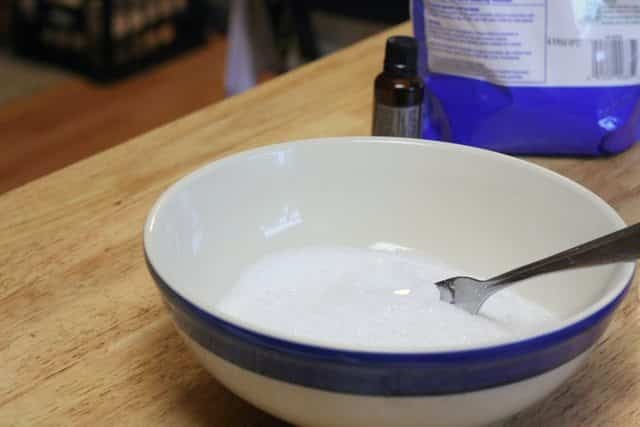 I use approximately 3 parts distilled water to 1 part cheap vodka, rubbing alcohol or witch hazel (any of these will do) and then add a few drops of essential oil. Another new item in our spa gift baskets is sleep pillows. When I saw this from Yearning and Learning I knew I needed to hit the thrift stores and look for some really fun cloth napkins, tea towels or hankies. She has a great list of herbs that will help you sleep and funny story about her husband so you’ll want to check it out. We’re able to grow luffa here, so I like to put in a homegrown luffa, too. And last but not least, I love to put a heat therapy rice bag in the spa gift baskets. These are so easy to make using a men’s tub sock and some flannel cotton fabric. We use these all winter as they’re great for warming up cold hands and feet. We also use them to take the chill out of the sheets before going to bed, just heat it up in the mircowave for a 2 minutes and it’s ready to use. Now, let’s talk scents for just a moment. Women are pretty easy to figure out a scent for but I have a hard time with scents for men. So, I was pretty excited to find this post from Jessica at The 104 Homestead on Personal Care for “Manly” Men. She has some great ideas and suggestions for scents for men. That’s about all I have, what are some things you like to put in spa gift baskets? I am planning on making a spa gift basket to donate to a fundraiser for the Make It Fit Foundation (autism awareness). I have not tried your recipes yet, but they sound fabulous! And the linen spray would be an unexpected surprise. Thank you for these great ideas! I’ll let you know how the basket turns out. Just a heads up — when you say “his and hers” — hers does not need an apostrophe! What a great fundraiser idea! I always get stumped when we need an item for a fundraiser. Thanks for helping me with my grammar. I remember a couple of days after posting this that it wasn’t right and I needed to fix it. And then promptly forgot. Thanks to you, it’s fixed now.